The Chinese regime’s top prosecutor said Jan. 3 that two Canadians detained after Canada arrested Huawei executive Meng Wanzhou had “without a doubt” violated the law. The president of a think tank that employs one of the men says he’s innocent. 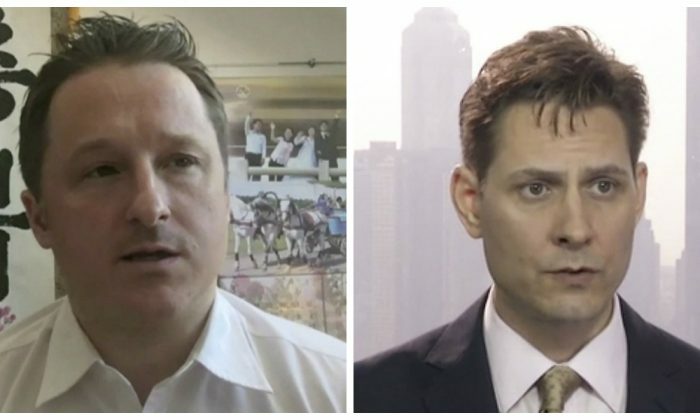 Authorities in Beijing previously said the two men—Michael Kovrig, a former diplomat and an adviser with the think tank International Crisis Group, and businessman Michael Spavor—are suspected of endangering state security. “Without a doubt, these two Canadian citizens in China violated our country’s laws and regulations, and are currently undergoing investigation according to procedure,” the regime’s prosecutor general, Zhang Jun, said. Zhang said, without elaborating, the investigation process had been handled “strictly” according to law, when asked by Reuters at a briefing when the two men might be charged. Robert Malley, president and CEO of International Crisis Group, said Kovrig wasn’t endangering national security as Beijing has alleged, and that detaining him may deter the international investment community from doing business in China. “I’m focused on getting him out and one thing I can say for sure, the one thing he wasn’t doing is endangering China’s national security,” Malley told CBC News. “Michael [Kovrig] was not doing anything that other people would not have been doing,” he added. Kovrig and Spavor were detained shortly after Canadian police arrested Meng, Huawei’s chief financial officer, on Dec. 1 in Vancouver at the request of the United States. U.S. prosecutors have accused Meng of misleading banks about transactions linked to Iran, putting the banks at risk of violating sanctions. There are growing security concerns from many countries and those in the cyber-intelligence community regarding the use of Chinese telecom companies, which include Huawei and ZTE, because of possible ties to the Chinese communist regime. The United States, Australia, and New Zealand have banned the use of Huawei equipment in their upcoming 5G networks. Canada is currently conducting a cybersecurity review of Huawei and 5G technology, but hasn’t made a decision on whether to ban the company from its 5G networks. Under the Chinese regime’s 2017 National Intelligence Law, companies are required to aid Beijing in national intelligence work. Huawei was founded by Meng’s father, Ren Zhengfei, who is a former People’s Liberation Army officer. Meng is the oldest daughter of Ren and is reportedly next in line to take over the company, the world’s largest telecom equipment maker and second-largest maker of smartphones. Beijing has only given vague details about the detention of the two Canadians, and hasn’t drawn a direct link to Meng’s arrest. The regime has demanded that Canada free her and threatened unspecified consequences if that doesn’t happen. Canada has called the detentions “deeply concerning” and “arbitrary,” and demanded the immediate release of the two men. U.S. Secretary of State Mike Pompeo has also called for their release, and the UK, EU, Australia, France, and Germany have all issued statements voicing concern over the detentions. While Beijing touts the rule of law, its judicial system is tightly controlled by the ruling Communist Party. Under Chinese criminal procedure law, special forms of detention and interrogation can be used for state security suspects. Rights groups say conditions in Chinese detention facilities are often primitive and can be harsh, with a lack of legal representation and due process compounding worries about treatment. While Meng has had full access to lawyers and is able to see her family, Kovrig is being denied legal representation, isn’t allowed to see family, and is limited to one consular visit a month, sources familiar with the situation told Reuters. “He’s not allowed to apply for bail and not allowed to see a lawyer,” one source told Reuters, adding Kovrig was being held at an undisclosed location, questioned every morning, afternoon, and evening and not allowed to turn the lights off at night. A third Canadian, Sarah McIver, had been detained in China for “illegal employment” but was released Dec. 28, 2018. The Chinese authorities have detained three Canadian citizens living or travelling in China.